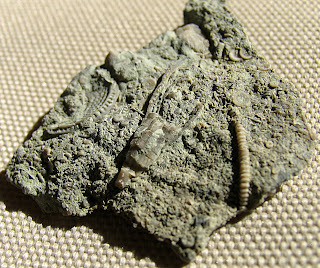 After the snow melted, I reviewed the cleaning piles and found another crinoid calyx. This calyx was found in the Kope Formation of Carroll County, Kentucky. 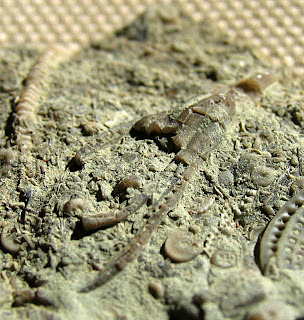 It is Ordovician Period and called Ectenocrinus simplex. The fossil is about 2 cm in length, the stem diameter is 2 mm and the cup at its widest is 5 mm. The longest arm is 1.2 cm and 3 arms are visible with a possible pinnule still attached to one arm.